Jim Ratcliffe backs shale gas to transform Grangemouth's fortunes, but he'd better watch out for the lesser spotted nimby. Ineos is planning to invest £640m to ‘frack’ near its Grangemouth plant in Scotland, according to the BBC. The firm hopes the shale gas there will supply cheap raw materials for the chemical facility, which has been operating at a loss. This comes as no surprise for those who’ve watched developments at Grangemouth. The first clue came when Ineos bought the shale gas exploration rights for 329 sq km of land next to the plant in August. MT’s suspicions were further aroused when Gary Haywood, chief executive of Ineos Upstream, it’s new oil and gas exploration division, said the firm had brought in American fracking experts and that ‘we are well placed to become a major player in the UK onshore gas and production sector’. By the time Ineos, owned by billionaire Jim Ratcliffe, bought the rights to another 400 sq km right next to the first, the writing was on the wall. Fracking involves injecting a blend of water and chemicals into underground shale rock at high pressures to force out gas and oil. For some reason, environmental campaigners and local nimbys aren’t impressed with the idea. Indeed, there have been claims that fracking could cause ecological damage, water pollution and even earthquakes. No one thus far has suggested it can sour milk, but who knows? Ineos is betting that these political concerns won’t threaten the existing, fracking-friendly regime, but with the general election looming, and with some in Scotland calling for fracking to be a devolved issue, this presents a certain risk. While the shale gas industry is expected to be worth £33bn over the next 15 years, and while Ineos has said it would give up to £2.5bn to local residents and landowners as ‘compensation’, it seems unlikelythat these risks will go away any time soon. 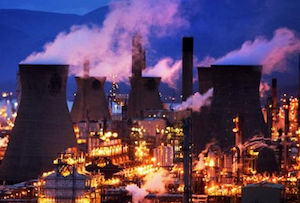 But given the woes that have befallen Grangemouth over the years, it may just be worth it.